The Canaan River pluton comprises megacrystic monzogranite and quartz diorite to monzodiorite that is exposed in several small inliers on the Carboniferous New Brunswick Platform west of Moncton in southeastern New Brunswick. Its distinct magnetic geophysical signature and borehole data suggest that the Canaan River pluton is part of a large buried felsic to mafic intrusive body that lies at relatively shallow depths beneath flat-lying Pennsylvanian sandstone on the platform. New laser ablation ICP-MS in situ analysis of the megacrystic monzogranite yielded a U–Pb zircon concordia age of 412.6 ± 2.1 Ma, indicating that the intrusion is of Early Devonian (upper Lochkovian) age. The new radiometric data along with lithological, geochemical, and isotopic data suggest that the Canaan River pluton is most like the megacrystic Hawkshaw Granite of upper Lochkovian age in the Pokiok Batholith in southwestern New Brunswick. The similarities shown by these granites suggests that they may have been generated in the same complex tectonomagmatic setting related to the successive arrival of the leading edge of Ganderia and Avalonia at the composite Laurentian margin during the Salinic and Acadian orogenies. Le pluton de la rivière Canaan est constitué de monzogranite mégacristallin et de diorite quartzique passant à de la monzodiorite exposée dans plusieurs petites boutonnières de la plateforme carbonifère du Nouveau-Brunswick, à l’ouest de Moncton, dans le sud-est du Nouveau-Brunswick. Sa signature géophysique magnétique distinctive et les données de puits de forage permettent de supposer que le pluton de la rivière Canaan représente une partie d’une masse intrusive felsique à mafique de forte dimension enfouie, reposant à une profondeur relativement faible sous le grès pennsylvanien horizontal de la plateforme. Une nouvelle analyse in situ par ICPMS avec ablation au laser a attribué au monzogranite macrocristallin un âge U-Pb sur zircon concordia de 412.6 ± 2.1 Ma, ce qui révèle que l’intrusion remonte au Dévonien précoce (Lochkovien supérieur). Les nouvelles données radiométriques tout comme les données lithologiques, géochimiques et isotopiques laissent présumer que le pluton de la rivière Canaan est très semblable au granite mégacristallin de Hawkshaw, qui remonte au Lochkovien supérieur, dans le batholite de Pokiok, dans le sud-ouest du Nouveau-Brunswick. Les similarités entre les granites laissent supposer qu’ils pourraient avoir été produits au sein du même cadre tectonomagmatique complexe apparenté à l’arrivée successive des fronts de la Gandérie et de l’Avalonie le long de la marge composite laurentienne durant les orogenèses salinique et acadienne. 1 The Canaan River pluton is located on Canaan River and in the surrounding area, about 40 km west of Moncton in southeastern New Brunswick (Fig. 1). Hamilton (1962) was the first to describe the megacrystic granite on Canaan River west of Moncton (Fig. 1), but since then very little work has been done. Whalen et al. (1986) named the granite the Canaan River pluton and sampled it as part of a larger isotopic and geochemical study. More detailed mapping of the Paleozoic inliers and surrounding Carboniferous rocks was conducted by St. Peter and Johnson (2006; 2008) and John-son and St. Peter (2008), but the pluton has never been formally named. Figure 1. Map of southern New Brunswick showing major geological subdivisions and Silurian and Devonian plutonic rocks. 2 The Canaan River area is largely underlain by flat-lying Pennsylvanian sandstone that is part of the Carboniferous New Brunswick Platform of Poole (1967), an area of uplifted Early Paleozoic basement within the larger Late Devonian to Lower Permian Maritimes Basin of Atlantic Canada (Roliff 1962; Bradley 1982; Gibling et al. 2008). The platform covers an area of over 25 000 km2 and forms the roughly tri angular area of Pennsylvanian Pictou Group that is exposed at surface over much of the eastern part of the province. The Pictou Group either disconformably overlies Mississippian red beds and peralkaline volcanic rocks or lies directly on pre-Carboniferous basement, as is the case with the Canaan River pluton (Ball et al. 1981; Fyffe and Barr 1986; Gray et al. 2010). 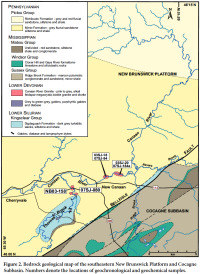 3 Pre-Carboniferous inliers are restricted to the southern parts of the platform between Chipman and Canaan River near the boundary between the New Brunswick Platform and the Cocagne Subbasin (Fig. 1). In addition to granite, thick turbidite sequences belonging to the Silurian Kings-clear Group of the Fredericton belt (e.g., Fyffe et al. 2011) and minor diorite are also exposed. These inliers are the surface expression of a shallow-buried basement high referred to as the “Minto-Chipman/Canaan River basement high”, which was delineated by a series of shallow boreholes that were drilled during a study to determine the coal potential of the Pennsylvanian rocks (Ball et al. 1981). Twelve of the boreholes that were drilled in the Chipman and Canaan River areas intersected granodiorite, slate, phyllite, and schist at depths of less than 122 m beneath the Pennsylvanian cover. The distribution of the boreholes that intersected pre-Carboniferous rocks indicated that the boundaries of the basement high are in part controlled by parallel, northwest-trending faults, suggesting a horst-like structure (Ball et al. 1981). A regional aeromagnetic survey subsequently revealed prominent, parallel, northwest-trending linear magnetic highs, one of which appears to mark the western boundary of the predicted basement horst (Kiss et al. 2004a, 2004b, 2004c). These positive linear magnetic features were interpreted to be mafic dykes intruded into northwest-trending structures, possible feeders to Mississippian volcanic rocks present west of the Canaan River area (Thomas and Kiss 2005). Subsequent mapping has shown that in most cases the bedrock at surface directly over the linear magnetic anomalies is part of the Pictou Group, thus indicating that the dykes are at least in part buried at shallow depths beneath the sandstone cover (St. Peter and Johnson 2006; Johnson and St. Peter 2008). One exception is on Coal Creek (Fig. 1), where a less prominent, northwest-trending linear magnetic anomaly oblique to the main trend of interpreted dykes is related to a lamprophyre dyke in the Flume Ridge Formation of the Kingsclear Group (St. Peter and Johnson 2008). 4 The boundary between the New Brunswick Platform and the Cocagne Subbasin to the southeast (Gussow 1953; St. Peter and Johnson 2009) is the northeast-striking Belleisle Fault (Fig. 1). In southwestern New Brunswick where Carboniferous cover is lacking, the Belleisle Fault separates Neoproterozoic and Early Paleozoic rocks of the New River, St. Croix, and Annidale belts and Silurian rocks of the Mascarene and Fredericton belts to the west, from the Early Silurian Kingston belt on the east (Barr et al. 2002; White et al. 2006; Fyffe et al 2011). Immediately west of the Belleisle Fault, the Neoproterozoic and younger rocks are intruded by Late Silurian to Late Devonian granitic to gabbroic plutons of the Saint George Batholith, and even farther west by the Pokiok Batholith (Fig. 1). 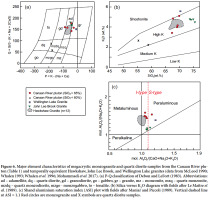 5 The purpose of this paper is to present a U–Pb (zircon) age for a sample of megacrystic granite collected from the Canaan River pluton on Thornes Brook (Fig. 2) and to compare its chemical characteristics to plutons of similar age in southern New Brunswick. Figure 2. 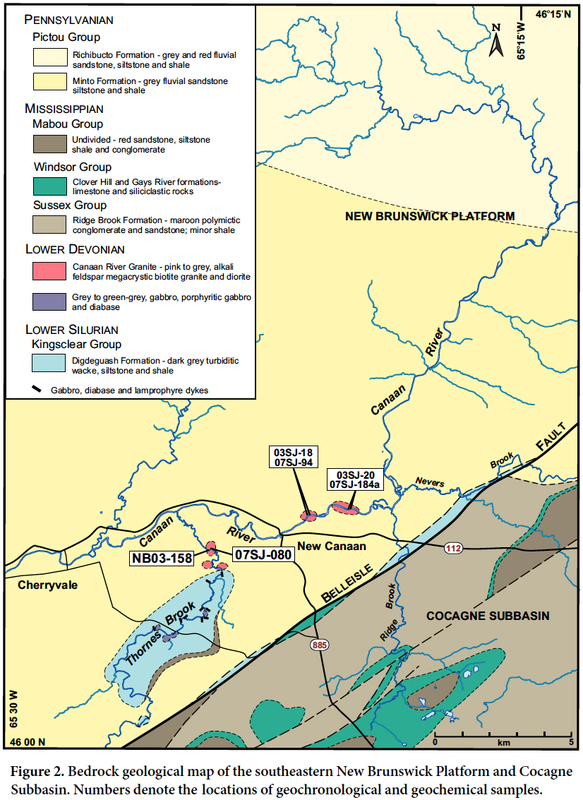 Bedrock geological map of the southeastern New Brunswick Platform and Cocagne Subbasin. 6 The Canaan River pluton occurs in several small inliers on Canaan River and its tributary Thornes Brook in the Cherryvale – New Canaan area (Fig. 2). The largest exposures are on Canaan River north of route 112 at New Canaan where megacrystic granite outcrops sporadically along the river bank for about 700 m. At those locations the granite is overlain by nearly horizontal beds of Pennsylvanian sandstone and pebbly conglomerate of the Minto Formation. A separate inlier about 1.5 km to the west consists of dark grey diorite cut by felsic veins and pods. On Thornes Brook, megacrystic granite is exposed in three separate inliers between 2 and 3 km south of its junction with Canaan River (Fig. 2). At the southernmost location the granite intruded graded feldspathic wacke and dark grey to black siltstone and shale of the Early Silurian Digdeguash Formation of the Kingsclear Group (St. Peter and Johnson 2006; Johnson and St. Peter 2008). 7 Although the majority of surface exposures in the Canaan River area are Carboniferous sandstone, the aeromagnetic signature suggests that the intrusive rocks are part of a much larger plutonic complex buried beneath a relatively thin cover of Carboniferous rocks. This is illustrated on the aeromagnetic map, which shows the granite and diorite on Canaan River clearly evident as magnetic low and high areas, respectively (Fig. 3). Based on the strength and arcuate shape of the aeromagnetic response, Thomas and Kiss (2005) proposed that a large mafic/felsic intrusive complex underlies an area of over 200 km2 . A coincident positive gravity anomaly associated with the intrusive complex (Thomas and Kiss 2005; their figure 19) suggests that the mafic components are predominant. 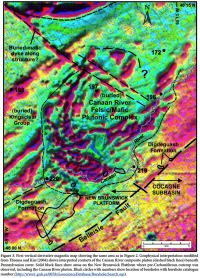 An obvious truncation of the magnetic highs associated with the Digdeguash Formation by the Canaan River intrusive complex is also evident on the magnetic map (Fig. 3). 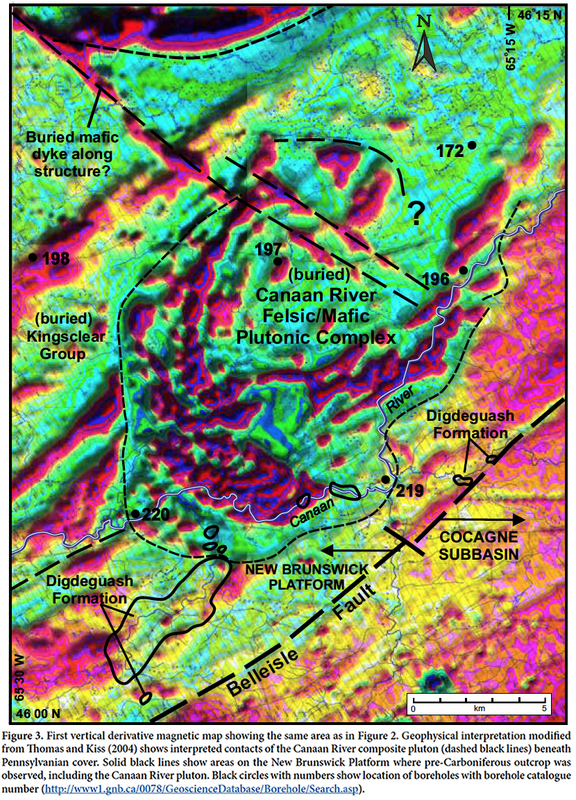 A northwest-trending, linear magnetic high interpreted to be a mafic dyke is also apparent in the upper left corner on Figure 3. As previously noted, similar northwest-trending dykes delineate the boundaries of horst and graben structures to the west and here it appears to partially cut the arcuate magnetic high associated with the intrusion. Although not shown, a positive gravity anomaly associated with the mafic rocks in the intrusive complex is also truncated sharply to the east along this lineament. It is interesting to speculate that the semicircular magnetic high that is cut-off at the northern map boundary is the continuation of the Canaan River intrusive complex that has been offset sinistrally by a northwest-trending fault; unfortunately, no deep borehole data are available in this area to confirm or refute this hypothesis. Figure 3. First vertical derivative magnetic map showing the same area as in Figure 2. Display large image of Figure 3Black circles with numbers show location of boreholes with borehole catalogue number (http://www1.gnb.ca/0078/GeoscienceDatabase/Borehole/Search.asp). 8 The boreholes drilled in the area indicate that the thickness of Carboniferous sandstone overlying the intrusion is variable. Granite and granodiorite were encountered at 30 and 40 m below surface in boreholes 219 and 220 near Canaan River, but only 9 km to the north, boreholes 172 and 196 to 198 penetrated Carboniferous sandstone for the entire depth of 122 m, although the magnetic response is still quite strong in that area (Fig. 3). Granite was intersected even deeper in hydrocarbon exploration boreholes drilled nearly 40 km to the northeast at Canaan Station and Coal Branch (Fig. 1), at depths of 330 and 362 m, respectively. Based on gravity data and the presence of fresh biotite and hornblende in the cuttings, St. Peter and Fyffe (1990) argued that the granite encountered in these deep boreholes is likely part of a buried Devonian pluton that is contiguous with the Canaan River pluton. 9 The main textural variety in the Canaan River pluton is pink to grey, very coarse- to medium-grained monzogranite containing potassium feldspar phenocrysts up to 6 cm in length, although 2 cm is more common (Fig. 4a). The monzogranite consists of approximately equal amounts of amounts of plagioclase, orthoclase, and quartz, and about 10% biotite. Apatite and zircon are abundant accessory phases, mainly as inclusions in biotite (Figs. 4b, c). Opaque phases are rare. Pink to grey aplite, biotite-rich fine-grained granite and microgranite porphyry dykes, and locally pegmatitic feldspar dykes were observed to have cut the monzo granite. On Thornes Brook the monzogranite contains large xenoliths of garnet-bearing metasedimentary rocks likely derived from the adjacent Digdeguash Formation. The latter contains abundant dykes of dark grey, fine-grained to medium-grained gabbro and plagioclase porphyry (Fig. 2), but the relationship of these mafic dykes to the Canaan River pluton is not known. 10 The dioritic inlier in Canaan River consists of dark grey, medium-grained quartz diorite to monzodiorite with felsic pods and veins. The rock consists of plagioclase, quartz, microcline, hornblende, and biotite, with accessory apatite, titanite, and magnetite. Figure 4. (a) Photograph of a cut slab from dated sample 07SJ-80 showing large alkali-feldspar megacrysts. (b) Photomicrograph of sample NB03-158 in plane polarized light; width of image is about 3 mm. (c) Same as (b) except with crossed polars. 11 A 1 kg sample (07SJ-080) of megacrystic granite from the Canaan River pluton was sent to Overburden Drilling Management (ODM) in Ottawa, Ontario, for electro-pulse disaggregation and initial zircon separation. Zircon grains for dating were then picked from the zircon concentrates at Cape Breton University. Selected grains were mounted in an epoxy-covered thin section at the University of New Brunswick, Fredericton, polished to expose the centres of the zircon grains, and imaged using cold cathodoluminescence to identify internal zoning and inclusions. These images were used to select ablation points (30 μm diameter), avoiding any visible inclusions, cracks, or other imperfections. 12 U and Pb isotopic compositions were measured using the Resonetics S-155-LR 193 nm Excimer laser ablation system connected to an Agilent 7700× quadrupole inductively coupled plasma – mass spectrometer in the Department of Earth Sciences at the University of New Brunswick, following the procedure outlined by McFarlane and Luo (2012). Data reduction was done in-house using Iolite software (Paton et al. 2011) to process the laser output into data files, and further reduced for U–Pb geochronology using VizualAge (Petrus and Kamber 2012). VizualAge outputs included uncorrected U–Pb ratios that were used to calculate 204Pb-based corrections (Andersen 2002) and 208Pb-based corrections. Data were filtered using 204 Pb as a monitor. In this sample no corrections were applied to any data, which are presented in the Appendix, where those used in calculating the concordia age reported below are highlighted. Data points included in the concordia calculations and reported here are grains that are 98% to 101% concordant and do not require a correction for common Pb (204Pb <80 counts per second). 13 Concordia ages were calculated using Isoplot versions 3.75 and 4.15 (Ludwig 2003, 2012). Ages are reported at 95% confidence, with decay-constant errors included in the calculations. The calculated concordia ages overlap with the weighted mean ages for the samples using all near-concordant data. 206Pb/238U ages are used in all the probability distribution calculations. The calculated concordia ages for reference materials FC1 and Plesovice during this analytical run are 1098.8 ± 2.5 Ma and 337.9 ± 2.4 Ma respectively, data for all reference materials are included in the Appendix. 14 The zircon grains in sample 07SJ-080 range from dark yellow to clear and are acicular to elongate and euhedral in shape. Most of the grains are <30 µm in size, but larger grains in the 50–100 µm range were picked for analysis. In CL most of the larger grains show clear oscillatory zoning typical of igneous zircon grains. The 206Pb/238U ages of grains between 98% and 101% concordant range between ca. 400 Ma and 425 Ma with one older grain at ca. 445 Ma (Figs. 5a and b). The main cluster of near-concordant grains (n = 8) yielded a concordia age of 412.3 ± 2.6 Ma (Fig. 5c), which we interpret as the best estimate of the igneous crystallization age of the rock. While both the MSWD and probability of concordance can be improved by using fewer grains in the concordia calculation, we prefer the approach of including as many grains as possible in order to get a representative concordia age. This concordia age overlaps with the weighted mean age of all the 98–101% concordant grains at 411.5 ± 4.7 Ma at 95% confidence. Three older grains with 206Pb/238U ages of 423.1, 426.3 and 445.9 are interpreted as either inherited or anticrystic grains formed from essentially comagmatic and related magma. Younger discordant grains are interpreted as results of Pb loss. Figure 5. (a) Histogram (blue) and probability plot (red line) showing 206Pb/238U zircon ages that are 98–101% concordant. (b) Concordia diagram showing data that are 98– 101% concordant. (c) Concordia diagram using 8 concordant grains that yielded a concordia age of 412.3 ± 2.6 Ma. 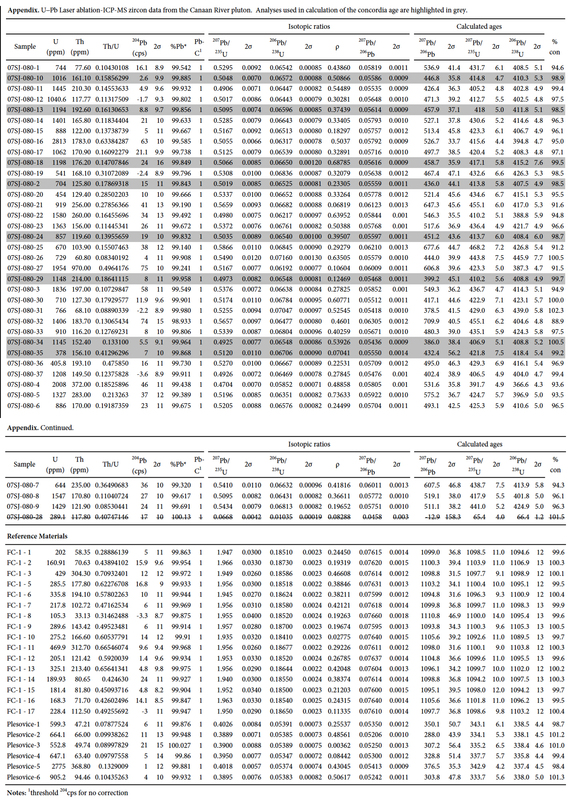 15 Four samples of megacrystic monzogranite and two samples of diorite were selected from the Canaan River pluton for whole-rock chemical analysis (Table 1). All samples were analyzed for major and trace elements, and three of the samples (two of monzogranite and one of diorite) also for rare-earth elements. 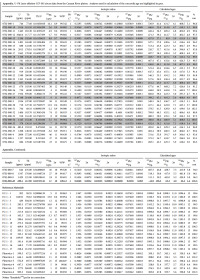 Analyses for one additional sample of megacrystic granite (P9-WXNB353) from Whalen et al. (1996) were also utilized. To facilitate discussion of the geochemistry, analyses for granites of similar Lower Devonian (upper Lochkovian) age in the Saint George Batholith (John Lee Brook and Wellington Lake plutons) and Pokiok Batholith (Hawkshaw Granite) were plotted on the geochemical diagrams for comparison. The analyses for the John Lee Brook Granite include samples 85MM154B, 7f1/87 and 7g76/87 from McLeod (1990) and P8-WXNB350 from Whalen et al. (1996). The one set of analyses from the Wellington Lake Granite (sample 15-72) is from Mohammadi et al. (2017). The set of twelve analyses for the Hawkshaw Granite are from Whalen (1993). Table 1. Major and trace element compositions of samples from Canaan River pluton. Coordinates are UTM Zone 20. 16 The five monzogranite samples from the Canaan River pluton range in SiO2 content between 67% and 70%, and the two quartz diorite samples have 55% and 59% SiO2 (Table 1). Based on major-element components, the felsic rocks vary from granite to quartz monzonite and granodiorite; the Canaan River dioritic samples are quartz monzodiorite (Fig. 6a). The Canaan River and all of the other upper Lochkovian age granite samples plot in the high-K field on the silica versus K 2 O diagram with the exception of the shoshonitic Wellington Lake Granite (Mohammadi et al. 2017) (Fig. 6b). On the aluminum saturation index (ASI) diagram, the Canaan River monzogranite samples plot in and near the field defined by chemical data from twelve samples of the Hawkshaw Granite from Whalen (1993), although the former samples are slightly more peraluminous (Fig. 6c). The Canaan River samples plot near the upper limit (<1.1) for I-type granite and transitional to S-type granite (Chappell and White 1974, 2001), which is similar to the S-type John Lee Brook Granite, although the latter is slightly more alkaline (Fig. 6c). Figure 6. Major element characteristics of megacrystic monzogranite and quartz diorite samples from the Canaan River pluton (Table 1) and temporally equivalent Hawkshaw, John Lee Brook, and Wellington Lake granites. 17 Both the felsic and mafic components of the Canaan River pluton exhibit similar rare-earth element (REE) patterns, with enrichment in light REE, small negative Eu anomalies, and relatively flat but slightly decreasing heavy REE profile (Fig.7a). The overall abundance of REE decreases with increasing SiO 2 content in the samples and is highest in the quartz diorite sample (~55% SiO 2 ) and lowest in the mon zogranite sample 07SJ-184a (~70% SiO 2 ), consistent with fractionation of REE-bearing minerals such as apatite and zircon. The quartz diorite also has slightly lower abundances of most large-ion-lithophile elements (LILE), with the exceptions of Sr and Eu (Fig. 7b), consistent with differentiation and fractional crystallization of plagioclase. The Hawkshaw Granite samples show nearly identical trace element patterns, although with lower Ba (Fig. 7b). 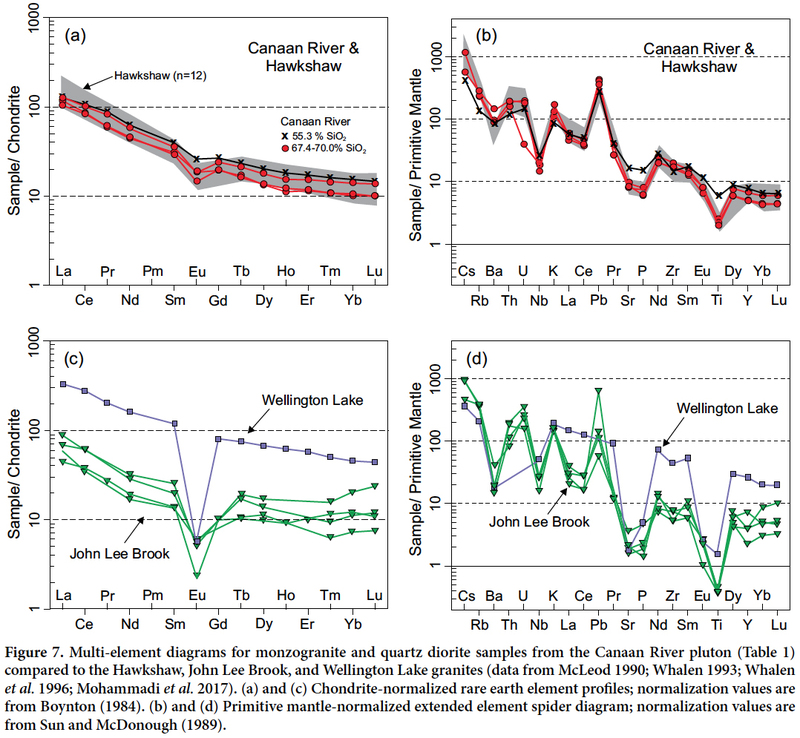 The John Lee Brook and Wellington Lake granites are also enriched in light REE relative to heavy REE but have much larger negative Eu anomalies than the Canaan River and Hawkshaw (Figs. 7a, c). The single Wellington Lake sample also has the highest absolute abundances of REE consistent with its A-type chemistry (Mohammadi et al. 2017). In contrast to all of the other samples the majority of John Lee Brook samples are enriched in the heaviest REE (Fig. 7c). The Canaan River, Hawkshaw, and John Lee Brook samples all have negative Nb and Ti anomalies, suggesting a subduction component or assimilation of an upper crustal material (Figs. 7b, d) consistent with the positions of most of the samples in the overlapping volcanic-arc and post-collisional granite fields (Fig. 8a) and in the field for slab failure plutons (Fig. 8b) on tectonic setting discrimination diagrams. Some of the Hawkshaw samples plot toward the within-plate granite field, as does the single Wellington Lake sample, but the latter has significantly higher Y (Fig. 8b). Figure 7. Multi-element diagrams for monzogranite and quartz diorite samples from the Canaan River pluton (Table 1) compared to the Hawkshaw, John Lee Brook, and Wellington Lake granites. Figure 8. Monzogranite samples from the Canaan River pluton (Table 1) and the Hawkshaw, John Lee Brook, and Wellington Lake granites. 18 The Canaan River monzogranite samples plot in or near the boundary of the combined field of I- and S- granites on diagrams that distinguish those granite types from A-type granitoids but near the upper limit in all of Ga/Al ratio and alkali element oxide and Zr contents (Figs. 9a, b). However, they do not show characteristics of evolved I- and S-type granites (Figs. 9c, d). 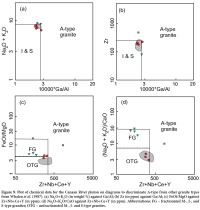 The Hawkshaw granite dataset overlaps the Canaan River samples on diagrams utilizing Ga/Al ratio and alkali element oxide and Zr contents to distinguish I- and S-type granites from A-type granites (Figs. 9a, b) and are similarly unevolved to slightly more evolved than the Canaan River samples (Figs. 9c, d). In contrast, the Wellington Lake granite plots clearly as A-type (Figs. 9a–d), as determined previously by Mohammadi et al. (2017) and the John Lee Brook near the boundary of I- and S-types (Figs. 9a, b), but clearly in the fractionated granite field (Figs. 9c, d). Figure 9. Plot of chemical data for the Canaan River pluton on diagrams to discriminate A-type from other granite types from Whalen et al. (1987). 19 Mohammadi et al. (2017) observed that La/Yb and epsilon Nd values varied systematically across the Saint George Batholith from southeast to northwest and demonstrated that the Early Devonian plutons in the northwest have considerably higher La/Yb ratios and lower epsilon Nd values than the Late Silurian plutons in the southeast. 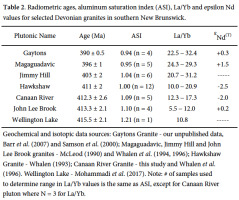 The La/Yb values determined for the Canaan River pluton range from 12.3 to 17.3, and therefore are significantly lower than those of the younger megacrystic Jimmy Hill, Magaguadavic, and Gaytons granites, but are comparable to the John Lee Brook and Hawkshaw granites of similar age (Table 2). However, when comparing the epsilon Nd data, the intrusions in the Saint George Batholith are mostly isotopically positive, ranging from + 3.3 for the A-type Welsford Granite to slight-ly negative - 0.4 for the S-type Tower Hill pluton (Whalen et al. 1994, 1996). In contrast, both the Canaan River and Hawkshaw granites have relatively high isotopically negative epsilon Nd values of - 2.0 and - 2.5, respectively, indicating that melting of surpracrustal material was involved in the generation of both of these granites (Whalen et al. 1996). Table 2. 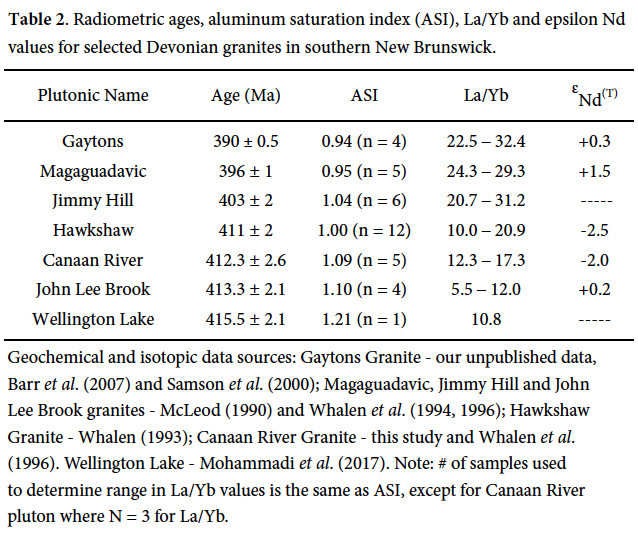 Radiometric ages, aluminum saturation index (ASI), La/Yb and epsilon Nd values for selected Devonian granites in southern New Brunswick. Display large image of Table 2Note: # of samples used to determine range in La/Yb values is the same as ASI, except for Canaan River pluton where N = 3 for La/Yb. 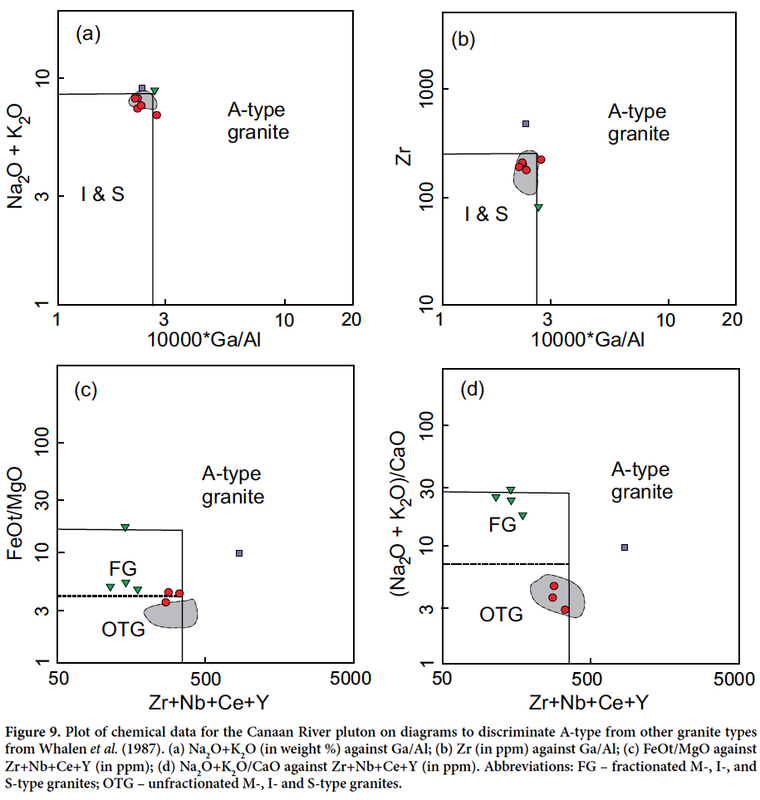 Geochemical and isotopic data sources: Gaytons Granite - our unpublished data, Barr et al. (2007) and Samson et al. (2000); Magaguadavic, Jimmy Hill and John Lee Brook granites - McLeod (1990) and Whalen et al. (1994, 1996); Hawkshaw Granite - Whalen (1993); Canaan River Granite - this study and Whalen et al. (1996). 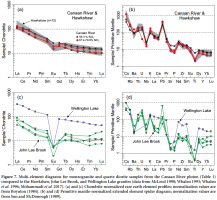 Wellington Lake - Mohammadi et al. (2017). 20 Late Silurian to Late Devonian intrusions are abundant in all lithotectonic belts northwest of the Belleisle Fault in southern and central New Brunswick (Figs. 1, 10). In contrast, the only known plutons of this age in Ganderian belts southeast of this fault are the ca. 390 Ma Gaytons Granite and similar granite intersected at depth in several boreholes on the buried Westmorland uplift (Barr et al. 2007; St. Peter and Johnson 2009). Devonian megacrystic varieties like that on Canaan River occur only in the Gaytons Granite, the Magaguadavic and Jimmy Hill granites in the Saint George Batholith and the Hawkshaw Granite in the Pokiok Batholith. The Gaytons Granite is composed main-ly of megacrystic quartz monzonite that yielded a Middle Devonian U–Pb (zircon) age of 390 ± 0.5 Ma (Barr et al. 2007), so is significantly younger than the 412.3 ± 2.6 Ma age determined for the Canaan River pluton. The host rocks of the Gaytons Granite are not exposed but the intrusion is chemically and mineralogically identical to and the same age as quartz monzonite drilled beneath Carboniferous strata south of Moncton and associated with buried anorthosite and ferronorite of the Lower Coverdale plutonic suite (White 1996; Barr et al. 2007; Tesfai 2011; Miller et al. 2018). It is unlikely that the Canaan River pluton is related to the Middle Devonian A-type Gaytons Granite (Barr et al. 2007). Indeed, documentation of many tens of kms of post-Devonian movement on the Belleisle Fault (Waldron et al. 2015) make any links between the Gaytons and Canaan Riv-er plutons unlikely. Figure 10. 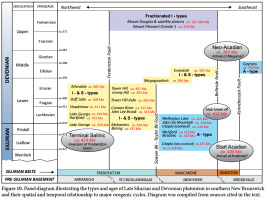 Panel diagram illustrating the types and ages of Late Silurian and Devonian plutonism in southern New Brunswick and their spatial and temporal relationship to major orogenic cycles. 21 The Saint George Batholith west of the Belleisle Fault (McLeod 1990; Mohammadi et al. 2017) is divided into three main groups based on age and petrogenetic characteristics: (1) Late Silurian bimodal A-type plutons (Bocabec, Utopia, Jake Lee, Welsford and Wellington Lake); (2) Early Devonian I – and S –type felsic intrusions (Magaguadavic, Jimmy Hill, John Lee Brook and Tower Hill), and (3) a much younger suite of Late Devonian fractionated I– type intrusions (Mount Douglas and satellite plutons). 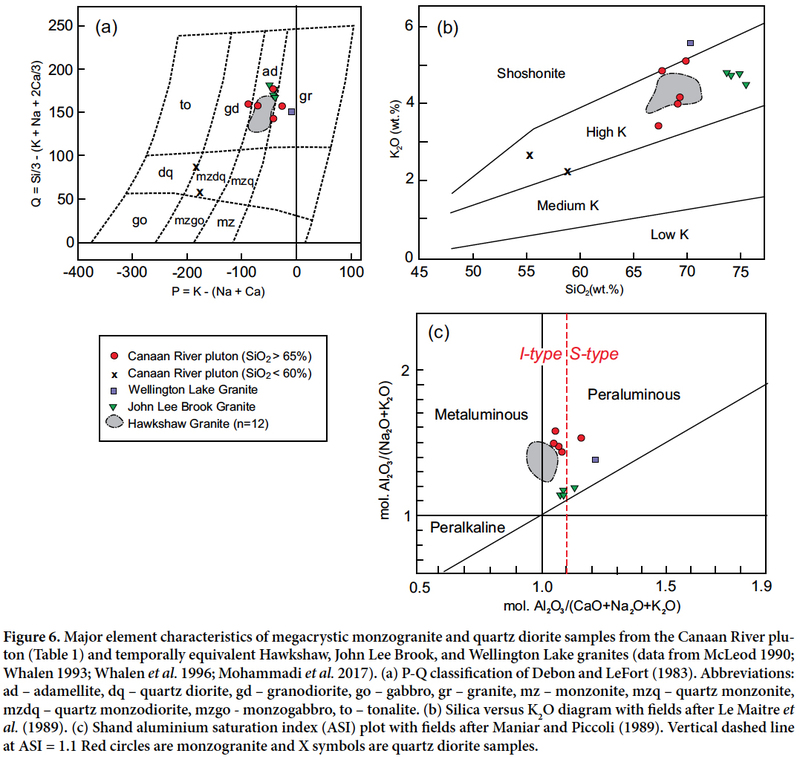 The megacrystic Magaguadavic and Jimmy Hill granites are also younger than the granite on Canaan River, as they have Early Devonian (Emsian stage) U–Pb (zircon) ages of 396 ± 1 Ma (Bevier 1990) and 403± 2 Ma (Davis et al. 2004), respectively. The only granite in the Saint George Batholith similar in age to the Canaan River pluton are the garnetiferous, two-mica John Lee Brook Granite and the Wellington Lake biotite granite both of which have upper Lochkovian ages of 413.3 ± 1 Ma and 415.5 ± 2.1, respectively (Mohammadi et al. 2017), however as described above they are different compositionally and geochemically than the Canaan River pluton. 22 The Pokiok Batholith is situated about 50 km northwest of the Saint George Batholith, on the west side of the Fredericton Fault (Venugopal 1979; McCutcheon et al. 1981; Lutes 1987; Whalen 1993; and Yang et al. 2008) (Fig. 1). The batholith intruded rocks of the Fredericton belt on its southeastern side and Cambrian to Early Ordovician rocks of the Miramichi belt (van Staal and Fyffe 1991; Fyffe 2001) along its northwestern side. All of the plutons in the Pokiok Batholith are Early Devonian (Bevier and Whalen 1990a, 1990b; Mc-Leod et al. 2003; Beal et al. 2010) and have chemical characteristics typical of I-type granitoids (Whalen 1993; Yang et al. 2008). A U–Pb (titanite) age of 411 ± 2 Ma (Bevier and Whalen 1990a, 1990b) for the Hawkshaw Granite, and a 414 ± 2 Ma (U–Pb zircon) age for related granodiorite at depth in the Lake George area (McLeod et al. 2003; Leonard et al. 2006; Lentz et al. 2016) indicate that the Hawkshaw Granite is the only megacrystic granite in the region known to be similar in age to the Canaan River pluton. Despite having no radiometric age control and chemical data from only one sample, Whalen et al. (1996) noted the lithological and geochemical similarities between the Canaan River and Hawkshaw megacrystic granites and our dating and geochemical data presented above further support a link between these two granites. 23 The systematic changes in isotopic and geochemical characteristics observed across the Saint George Batholith by Mohammadi et al. (2017) are similar to those previously observed by Whalen et al. (2006) across a major suture zone in central Newfoundland. This led Mohammadi et al. (2017) to suggest that the changes were reflecting the position of these granites relative to the Acadian suture zone. The Belleisle Fault is a major structure that separates the Silurian Kings-ton arc and Mascarene backarc basin that formed above a northwest-directed subduction zone beneath the trailing edge of Ganderia (Fyffe et al. 1999, 2011; Barr et al. 2002). The older parts of the Saint George Batholith were emplaced following the arrival of Avalonia during the middle Silurian onset of the Acadian orogeny (Fyffe et al. 1999, 2009, 2011; Barr et al. 2002; van Staal et al. 2009; Mohammadi et al. 2017). 24 Whalen et al. (2006) attributed the changes in La/Yb and epsilon Nd values over time in Newfoundland, to slab break-off and the transition from shallow-level melting of juvenile crust adjacent to the suture zone to deeper-level melting of old granitic basement farther away in the backarc area. Mohammadi et al. (2017) invoked the same model to explain the shift from older bimodal, A-type magmatism to felsic I- and S-type magmatism in the Saint George Batholith, suggesting it reflected the change from an extensional tectonic regime in the Masacrene backarc basin to a transpressional environment related to the continued convergence of the Avalonian microplate and slab-break off closer to the telescoped boundary between the Fredericton Trough, St. Croix belt, and Mascarene backarc basin (Fyffe et al. 2011). 25 The Canaan River, Hawkshaw, and John Lee Brook granites all exhibit strong negative Nb and Ti anomalies typical of arc-related rocks. However, the arc-like signature could be inherited from upper crustal source rocks as all of these granites were emplaced into rocks of the Fredericton trough, interpreted as a foredeep basin formed during loading of the passive margin of the Tetagouche backarc basin by the overriding Brunswick subduction complex (van Staal et al. 2003). The signature may also be indicative of slab-breakoff during the Acadia orogeny, as postulated by Whalen et al. (2006). 26 The arrival of the leading edge of Ganderia at the Laurentian margin and subsequent inversion of the Fredericton Trough during the terminal Salinic orogeny coincided with the arrival of Avalonia at its trailing edge and the onset of the Acadian orogeny, resulting in a highly complex geodynamic setting (e.g., van Staal et al. 2009; van Staal and Barr 2012). The mechanism by which the Pokiok Batholith and other plutons in the Central Plutonic belt were generated has been ascribed to crustal thickening following Salinic orogenesis and/or underthrusting of Ganderia’s trailing edge by the leading edge of Avalonia (van Staal et al. 2009; Wilson and Kamo 2016). The Early Devonian units of the Pokiok Batholith (e.g., Hawkshaw) and Saint George Batholith (e.g., John Lee Brook), as well and the Canaan River pluton (Fig. 10) were emplaced immediately after these terranes and their Silurian cover were telescoped into an area less than 150 km wide due to orthogonal shortening (Mohammadi et al. 2017). The current position of the Canaan River pluton suggests that the older A-type, bimodal intrusions proximal to the Acadian suture were cut out along the Belleisle and other faults in the Canaan River area by regional-scale strike slip faulting (Fig. 1). 27 The Canaan River pluton was emplaced into rocks of the Fredericton trough during the Lochkovian stage of the Early Devonian. Although its current position immediately west of the Belleisle Fault appears to suggest that it is in a similar tectonostratigraphic position as the southern parts of the Saint George Batholith, the ages and isotopic and chemical characteristics of the latter intrusions are considerably different. Although the isolated location and limited exposures of the Canaan River pluton make regional correlations uncertain, its tectonostratigraphic setting, U–Pb age and geochemical data presented above indicate that the Canaan River pluton is more similar to units on the northwestern margin of the Saint George Batholith and especially the Hawkshaw Granite of the Pokiok Batholith, emplaced into sedimentary rocks of the Fredericton Trough. This interpretation indicates that the older A-type, bimodal intrusions proximal to the Acadian suture have been cut out along the Belleisle Fault in the Canaan River area by regional-scale strike slip faulting, thus explaining the termination of the Saint George Batholith and the whole Coastal Maine Magmatic Province. 28 The similarity of the Canaan River pluton to the Hawkshaw Granite also raises the possibility of the potential for the Canaan River pluton to host tungsten and/or intrusion-related gold - antimony mineralization, as studies on the Lake George Antimony deposit suggest that it is related to granodiorite that has been genetically linked to the Hawkshaw phase of the batholith (Seal et al. 1985; Lentz et al. 2002; Yang et al. 2002, 2008; Thorne and McLeod 2003; Thorne 2005). We thank Dr. Chris McFarlane and Brandon Boucher for assisting D. van Rooyen with the U–Pb dating at the University of New Brunswick and for providing invaluable advice in processing and interpreting the age data. We also thank journal reviewers Joe Whalen and Dave Lentz and editor David West for their helpful comments. Sandra Barr’s work in New Brunswick has been funded mainly by Research Agreements with the New Brunswick Department of Energy and Resource Development. Ball, F.D., Sullivan, R.M., and Peach, A.R. 1981. Carboniferous drilling project. New Brunswick Department of Natural Resources, Mineral Development Branch, Report of Investigations 18, 109 p.
Bevier, M.L. 1990. Preliminary U–Pb geochronologic results for igneous and metamorphic rocks, New Brunswick. In Project Summaries for 1989, Fourteenth Annual Review of Activities. Edited by S.A. Abbott. New Brunswick Department of Natural Resources and Energy, Minerals and Energy Division, Information Circular 89-2 (Second Edition), pp. 208–212. Bevier, M.L. and Whalen, J.B. 1990b. 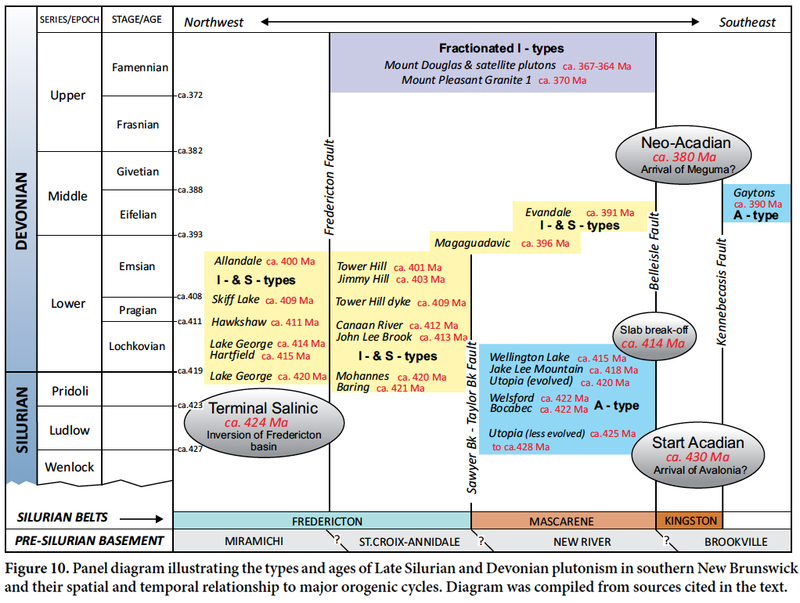 U–Pb geochronology of Silurian granites, Miramichi Terrane, New Brunswick. In Radiogenic age and isotopic studies: Report 3. Geological Survey of Canada, Paper 89-2, pp. 93–100. Chappell, B.W. and White, A.J.R. 1974. Two contrasting granite types. Pacific Geology, 8, pp. 173–174. Christiansen, E.H. and Keith, J.D. 1996. Trace-element systematics in silicic magmas: a metallogenic perspective. In Trace Element Geochemistry of Volcanic Rocks: Applications for Massive Sulfide Exploration. Edited by D.A. Wyman. Geological Association of Canada, Short Course Notes 12, pp. 115–151. Gibling, M.R., Culshaw, N., Rygel, M.C., and Pascucci, V., 2008. 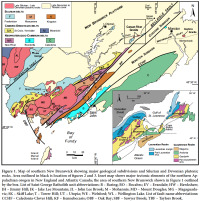 The Maritimes Basin of Atlantic Canada: Basin creation and destruction in the collisional zone of Pangea, In Sedimentary basins of the world, Volume 5. Edited by K.L. Hsü. Amsterdam, Elsevier Science, p. 211–244. Gussow, W.C. 1953. Carboniferous stratigraphy and structural geology of New Brunswick, Canada. American Association of Petroleum Geologists, Bulletin 37, no. 7, pp. 1713–1816. Hamilton, J.B. 1962. Salisbury map-area (west half), New Brunswick. New Brunswick Department of Lands and Mines, Mines Branch, Geological Notes Series, PM 60-5, 15 p.
Hildebrand, R.S. and Whalen, J.B. 2015. Arc and slab-failure magmatism in Cordilleran batholiths II – The Cretaceous Peninsular Ranges Batholith of Southern and Baja California. In Stirring The Pot, A Celebration of the Career of Paul F. Hoffman. Edited by J.B. Murphy, R.S. Hildebrand, and G.P. Halverson. Geoscience Canada Reprint Series, 11: 239–267. Johnson, S.C. and St. Peter, C.J. 2008. Geology of the Canaan River area (NTS 21I/03d), Kings and Queens counties, New Brunswick. New Brunswick Department of Natural Resources, Minerals, Policy and Planning Division, Plate 2008-181, scale 1:20 000. Kiss, F., Potvin, J. and Coyle, M. 2004a. Shaded magnetic first vertical derivative, Chipman New Brunswick (21I/04). Geological Survey of Canada, Open File 4651, New Brunswick Department of Natural Resources, Minerals, Policy and Planning Division, Plate 2004-11A, scale 1:50 000. Kiss, F., Potvin, J. and Coyle, M. 2004b. Shaded magnetic first vertical derivative, Salisbury, New Brunswick (21I/03). Geological Survey of Canada, Open File 4650, New Brunswick Department of Natural Resources, Minerals, Policy and Planning Division, Plate 2004-10A, scale 1:50 000. Kiss, F., Potvin, J. and Coyle, M. 2004c. Shaded magnetic first vertical derivative, Codys New Brunswick (21H/13). Geological Survey of Canada, Open File 4648, New Brunswick Department of Natural Resources, Minerals, Policy and Planning Division, Plate 2004-8A, scale 1:50 000. Le Maitre, R.W., Bateman, P., Dudek, A.J. and Keller, M.J. 1989. A Classification of Igneous Rocks and Glossary of Terms, Blackwell, Oxford, 193 p.
Lentz, D.L., Thorne, K., and Yang, X. 2002. Preliminary analysis of the controls on the various episodes of gold mineralization at the Lake George antimony deposit, New Brunswick. In Current Research 2001. Edited by B.M.W. Carroll. Department of Natural Resources and Energy; Minerals, Policy and Planning Division, Mineral Resource Report 2002-4, pp. 55–79. Lentz, C.P.E., McFarlane, C.R.M., Thorne, K.G., and Archibald, D.A. 2016. The Lake George polymetallic vein systems: new geochronologic results of various magmatic and hydrothermal events. In Abstracts 2016: Exploration, Mining and Petroleum New Brunswick. Edited by E.A. Keith. New Brunswick Department of Energy and Resource Development, Geoscience Report 2016-3, p. 18. Lutes, G.G. 1987. 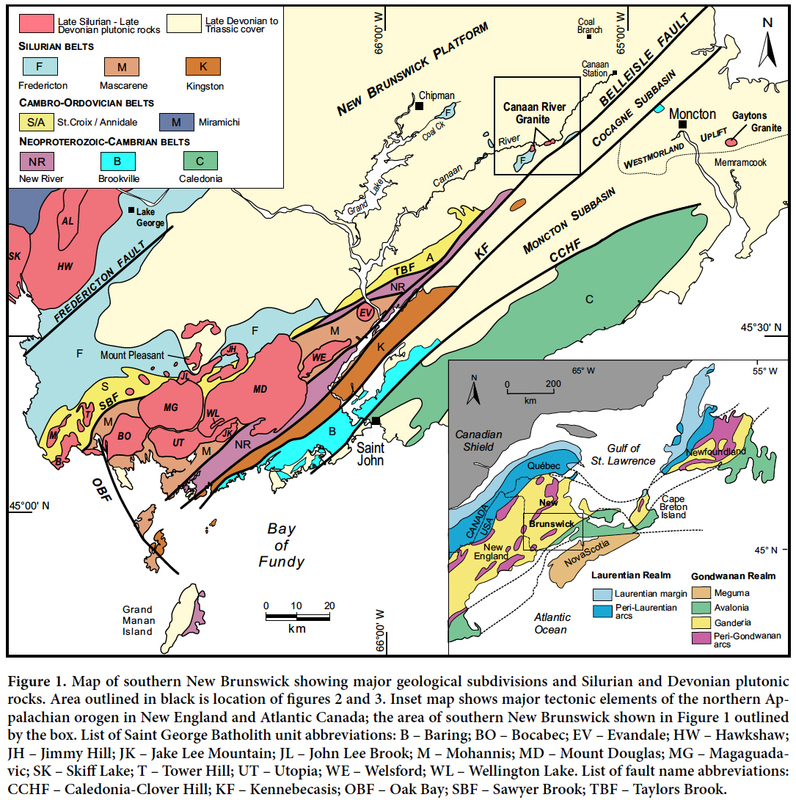 Geology and geochemistry of the Pokiok Batholith, southwestern New Brunswick. New Brunswick Department of Natural Resources and Energy, Minerals and Energy Division, Report of Investigation 22, 41 p.
McFarlane, C.R.M. and Luo, Y. 2012. U–Pb Geochronology Using 193 nm Excimer LA-ICP-MS Optimized for In Situ Accessory Mineral Dating in Thin Sections. Geoscience Canada, 39, pp. 158–172. McLeod, M.J. 1990. Geology, geochemistry and related mineral deposits of the Saint George Batholith; Charlotte, Queens and Kings counties, New Brunswick. New Brunswick Department of Natural Resources and Energy, Mineral Resources, Mineral Resource Report 5, 169 p.
Pearce, J.A. 1996. Sources and settings of granitic rocks. Episodes, 19, pp. 120–125. Poole, W.H. 1967. Tectonic evolution of the Appalachian region of Canada. In Geology of the Atlantic Region. Edited by E.R.W. Neale and H. Williams. Geological Association of Canada, Special Paper 4, pp. 9–51. Roliff, W.A. 1962. The Maritimes Carboniferous basin of eastern Canada. Geological Association of Canada, Proceedings, 14, pp. 21–41. Seal, R.R., Clark, A.H., and Morrissy, C.J. 1985. Lake George southwestern New Brunswick: a Silurian, multi-stage, polymetallic (Sb-W-Mo-Au-base metal) hydrothermal centre. In Recent Advances in the Geology of Granite-Related Mineral Deposits. Edited by R.P. Taylor and D.F. Strong. Canadian Institute of Mining and Metallurgy Conference on Granite-Related Mineral Deposits, Special Volume 39, pp. 252–264. St. Peter, C.J. and Johnson, S.C. 2006. Geology of the Ridge Brook/Havelock area (NTS 21I/03c), Westmorland, Kings and Queens counties, New Brunswick. New Brunswick Department of Natural Resources, Minerals, Policy and Planning Division, Plate 2006-25, scale 1:20 000. St. Peter, C.J. and Johnson, S.C. 2008. Geology of the Red-bank area (NTS 21I/04f), Queens County, New Brunswick. New Brunswick Department of Natural Resources, Minerals, Policy and Planning Division, Plate 2008-183, scale 1:20 000. St. Peter, C.J. and Johnson, S.C. 2009. Stratigraphy and structural history of the late Paleozoic Maritimes Basin in southeastern New Brunswick, Canada. New Brunswick Department of Natural Resources; Minerals, Policy and Planning Division, Memoir 3, 348 p.
Tesfai, F.G. 2011. Petrology and Ti-P-V potential of the Lower Coverdale plutonic suite, southeastern New Brunswick, Canada. Unpublished M.Sc thesis, Acadia University, Wolfville Nova Scotia, 234 p.
Thomas, M.D. and Kiss, F. 2005. Geological Interpretation of the Marrtown Aeromagnetic Survey, southeastern New Brunswick. Geological Survey of Canada, Open File 4953. New Brunswick Department of Natural Resources, Minerals Policy and Planning Division, Plate 2005-21E, scale 1:125 000. Thorne, K.G. 2005. Controls on mineralization at the Main Zone of the Clarence Stream gold deposit, southwestern New Brunswick. Unpublished Ph.D. thesis, University of New Brunswick, Fredericton, New Brunswick, 403 p.
Thorne, K.G. and McLeod, M.J. 2003. Gold deposits associated with felsic intrusions in southwestern New Brunswick-Field Guidebook. New Brunswick Department of Natural Resources, Minerals, Policy and Planning Division, Open File 2003-4, 83 p.
van Staal, C.R. and Fyffe, L. R. 1991. Dunnage and Gander zones, New Brunswick: Canadian Appalachian Region. New Brunswick Department of Natural Resources and Energy, Mineral Resources, Geoscience Report 91-2, 39 p.
van Staal, Wilson, R.A., Rogers, N., Fyffe, L.R., Langton, J.P., McCutcheon, S.R., McNicoll, V., and Ravenhurst, C.E. 2003. Geology and tectonic history of the Bathurst Supergroup, Bathurst Mining Camp, and its relationship to coeval rocks in southwestern New Brunswick and adjacent Maine - a synthesis. Economic Geology Monograph 11, pp. 37–60. van Staal, C.R., Whalen, J.B., Valverde-Vaquero, P., Zagorevski, A., and Rogers, N. 2009. Pre-Carboniferous, episodic accretion-related, orogenesis along the Laurentian margin of the northern Appalachians. In Ancient Orogens and Modern Analogues. Edited by J.B. Murphy, J.D. Keppie, and A.J. Hynes. Geological Society, London, Special Publication, 327, pp. 271–316. Venugopal, D.V. 1979. Geology of Debec Junction-Gibson Millstream-Temperance Vale-Meductic region, map-areas G-21, H-21, I-21, and H-22 (Parts of 21 J/3, 21 J/4, 21 G/13, 21 G/14). New Brunswick Department of Natural Resources, Mineral Resources Branch, Map Report, 79-5, 36 p.
Whalen, J.B. 1986. A-type granites in New Brunswick. Geological Survey of Canada, Current Research, Part A. Paper 86-1A, pp. 297–300. White, C.E. 1996. Geology, geochronology, and tectonic evolution of the Brookville Terrane, southern New Brunswick. Unpublished Ph.D. thesis, Dalhousie University, Halifax, Nova Scotia, 513 p.
Yang, X., Lentz, D.R., Hall, D.C., and Chi, G. 2002. Petrology of the Lake George granodiorite stock, New Brunswick: implications for crystallization conditions, volatile exsolution and W-Mo-Au-Sb mineralization. Geological Survey of Canada, Current Research, 2002-E14, 12p. Appendix. U–Pb Laser ablation-ICP-MS zircon data from the Canaan River pluton. Analyses used in calculation of the concordia age are highlighted in grey.